We love it when things are organized neatly. 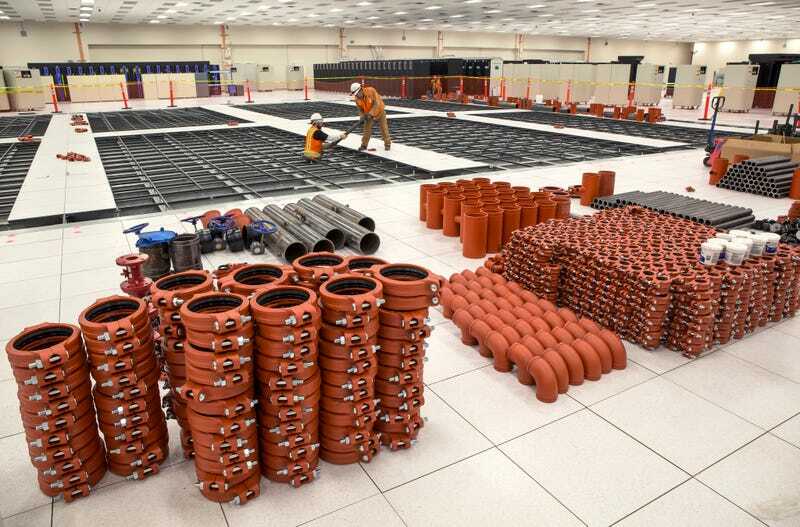 This tidy pile of warm-water cooling components is at the Strategic Computing Center of Los Alamos National Laboratory, where installation of an energy-saving cooling infrastructure to support the Trinity Platform is well underway. The Trinity supercomputer is the first of the NNSA's Advanced Simulation and Computing program's advanced technology systems. Once installed, Trinity will be the first platform large and fast enough to begin to accommodate finely resolved 3D calculations for full-scale, end-to-end weapons calculations. But the installation of such a powerful supercomputer is no small task. In order to accommodate Trinity, the SCC first had to undergo a series of major mechanical and electrical infrastructure upgrades. Because energy conservation is a priority at Los Alamos, these upgrades included a shift to warm water cooling technology (which will result in a major energy savings), as well as a decrease in the use of city/well water for cooling towers. Instead of city water, the new cooling plant will utilise water from LANL's Sanitary Effluent Reclamation Facility (SERF), saving millions of gallons of well water per year.